Part of the Semboku-Kosoku line (Osaka Prefectural Urban Development Co) from Nakamozu to Komyoike, for the class 6000 train. It is a 1067 mm gauge line and is electrified (1500 V DC). Many nice trackside details, and also a few landscape details. Line map over railroads and subway in the Osaka area (Acrobat document). The Semboku-Kosoku line (pink color at the map) from Nakamozu and southwards to Komyoike. Stations at the Semboku Kosoku line. 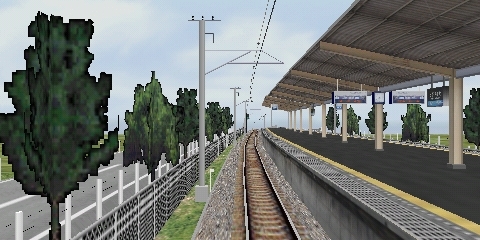 Click at Map by a station's name to show a map over the station and its closest surroundings.